I’ve always been someone who is a different thinker. When I was a kid and started to understand words and their meanings, other kids saw meat as food, because they were told it was food, but I saw meat as dead animals. For instance, when I was served chicken, I refused because I didn’t want to eat a chicken. It wasn’t food to me, it was an animal. Other kids were sitting at the table to finish their broccoli and I was sitting to finish my ground meat. Thinking outside of the box continued throughout my life. I never thought something because someone else told me to think it. I always used my own mind to look at things from different perspectives and come up with what made sense to me. That’s led me to a life I love where I am creative and able to do things my way. If you want to think outside the box, following are some affirmations that can help. When we listen with an open mind, there are concepts that we take in and play with within our mind. Sometimes these concepts help us to see something in a completely different way and make decisions that we normally wouldn’t make. For instance, while I wouldn’t eat meat, I did eat dairy until I was 40. I was stuck on traditional values around milk and how good it was supposed to be for our body. And, I was unwilling to listen to anyone who had a different opinion. But, once I started to be more open to anti-dairy arguments, I realized that I was wrong. Dairy was likely the cause of some symptoms I was having. I tested out my new theory – despite other people’s traditional values and concerns – and realized it was true. Dairy wasn’t the health promoting food I thought it was for me. I stopped eating it and many weird symptoms went away, like arthritic pain, bloated stomach, and extreme fatigue. When you open up your mind to other people’s opinions, you can pick and choose what works for you and what doesn’t… and, believe me, there will be some new information that will help you think outside of the box and change your life. The best way to get stuck inside the box is to avoid learning and growing as a person. Personal development is so important that you will find many ‘ways to think outside the box’ lists that just contain different forms of learning. If you are going to make a New Year’s Resolution – or a goal in general, then aiming to constantly learn new things each week is a good one! It will help you learn new things, adopt new beliefs, and think outside of the box. Aim to take classes or read more books. Sign up for something like Skillshare and take a few classes each week on things you are interested in. Listen to people you work with or hang out with and be curious about things they can teach you. Learn about different beliefs and customs. Learn. Learn. And then learn some more. Thinking outside of the box will become easier and easier when you do. There are a few exercises on this Psychology Today article that you can try to get your brain in shape to think outside of the box. The first exercise, where you rearrange letters in a word, surprised me. Why? Because, one of my first jobs was a housekeeper in a hospital where I worked the evening shift. It was easy to get my work done in the evening, and free-time was abundant – especially for a young person who didn’t think about doing extra work. I would often sit for a long time and look at one word signs and try to create as many words as I could out of them. I’m currently taking Super Brain by Jim Kwik, which is a course that helps you to strengthen your memory and brain in general. As he often says, practice makes progress, so it’s important to keep up the brain exercises even if they don’t seem to be doing a lot for your brain or creativity at first. 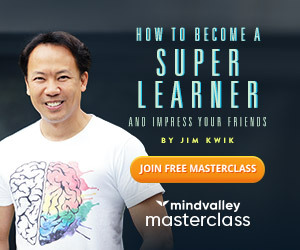 If you’re interested in what Jim Kwik has to teach, you can take a free masterclass by him here. Thinking outside of the box means letting yourself see things from different angles. If you are always trying to implement and be productive, you will never allow yourself the time to zone out, imagine, and come up with new ideas. Often when I struggle to come up with new ideas for my writing, I will allow myself to daydream. Starting with a random thought and allowing myself to jump from thought to thought, no matter how unrelated they seem, often leads me to something that I would have never thought of. If you are used to looking at a certain side of things, then it’s time to adopt this affirmation and start looking at all sides of things. For instance, if you are used to looking at the negative side of things, it’s time to look at the positive side of things and flip a switch in your mental routine. It will help you see things differently and you never know what that will result in when it comes to your happiness, relationships, health, work, goals, and other aspects of your life. Don’t get stuck in one way of looking at things. There are many different ways, which you can see simply by watching how everyone responds to things differently. Everyone has a unique way to look at things, and some of us, who have an easier time thinking outside of the box, can understand a lot of those viewpoints. How would you define your luck?